Dev-Em is a DC Comics character who comes from Krypton – and thus has the same powers as Superman. 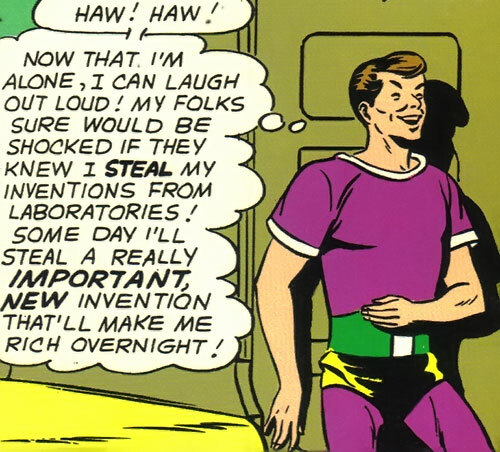 He operates in the far future, in the time of the Legion of Super-Heroes. 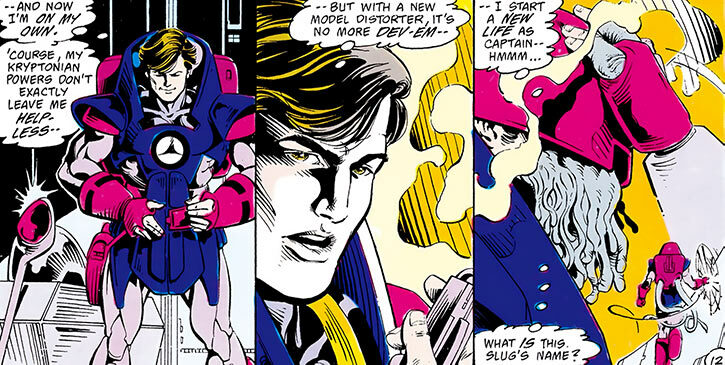 This profile is specifically about Dev-Em as he existed before Crisis on Infinite Earths (1985-1986). 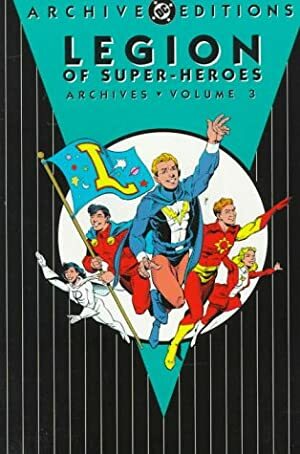 In particular, the version that appeared after the Crisis but before the 1994 reboot of the Legion of Super-Heroes is a different character. Group Affiliation: Interstellar Counter-Intelligence Corps (ICC). Superstrength, superspeed, super-senses, heat vision, super-breath, invulnerability, flight, yadda yadda yadda, you know the drill. As a Kryptonian, Dev-Em had the normal science-intensive education. Dev-Em also had a gift for electronics and, well, theft. Even as a teenager he could disable fairly complicated security systems. A long time ago, orbiting a star far, far away, a wild and irresponsible youth named Dev-Em lived on the fabulous world of Krypton. His parents thought him a fine lad, not suspecting the wild and reckless acts of vandalism and theft that he committed with his buddies. The Em family were amazed by his many brilliant discoveries and his modesty in keeping them secret. They did not suspect that his inventions were all stolen. Dev-Em hoped some day to steal a really important invention that would make him rich overnight. In the meantime, he and his cronies carried out senseless acts of vandalism and played dangerous pranks. Dev-Em’s family were friendly with their neighbors, the Els – Jor-El, Lara, and their infant son Kal-El. When Jor-El publicly announced that Krypton would explode and that he was designing a spaceship so that Kryptonians could flee, Dev-Em decided that the rocket design was the invention for which he’d been waiting. Dev-Em broke into Jor-El’s lab without setting off any alarms, but he was overheard by baby Kal-El and the family dog, Krypto. They roused the household and Jor-El threw Dev-Em out. Out of respect for Dev’s parents, Jor-El did not report the crime. He warned Dev-Em in the strongest possible terms that he would not show such restraint a second time. But once was enough. Before Jor-El caught him, Dev-Em had pocketed a copy of the plans for Jor-El’s star drive. He’d also found notes on the nuclear reaction taking place at Krypton’s core and the accelerating formation of Kryptonite. Seeing the evidence Jor-El had collected of the coming disaster, Dev-Em decided to forget about profit and work on a plan to save himself and his family. Using Jor-El’s notes and equipment stolen from other labs, Dev-Em somehow converted a bomb shelter into a lead-coated space vehicle large enough to hold both him and his parents. So, on the terrible day Krypton exploded, Dev-Em and his parents escaped into space just like Kal-El. Kal-El’s advanced ship took him quickly to Earth. Dev-Em’s improvised model followed more slowly. Dev-Em and his parents made the trip, which took years, in suspended animation. By the time they reached Earth, Kal-El had grown into a teenager. He’d also become world famous as Earth’s greatest hero, Superboy. Dev-Em woke when his ship crash-landed on Earth. His parents’ suspended animation pods were undamaged and they remained asleep. Dev-Em decided to explore before waking his parents. He quickly discovered his new super-powers… and his old neighbor, Superboy. 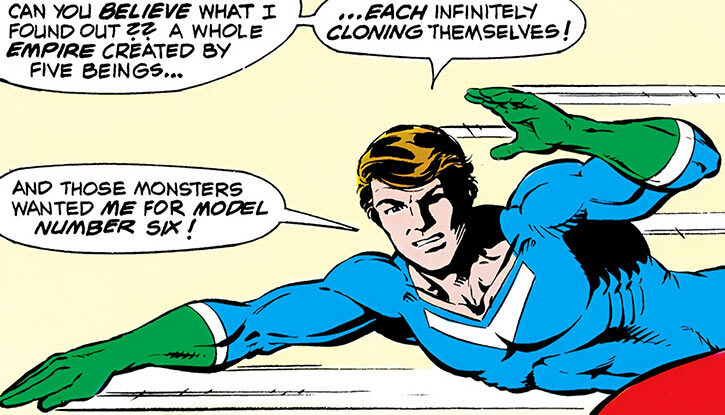 No doubt reacting to the trauma of losing his world, he ambushed Superboy, banished him to the Phantom Zone, assumed his identity, and committed enough crimes to trash Superboy’s reputation. But Dev-Em apparently tired quickly of this mischief. Perhaps he wasn’t sure what to do next. Certainly he found 20th century Earth to be primitive and not at all to his liking. There was also the matter of how his parents would react when they were revived. So Dev-Em released Superboy from the Zone, smugly sure he’d ruined Superboy’s life. Leaving Superboy to deal with the mess, Dev-Em flew back to the ship where his parents slumbered and carried the whole thing through the time barrier. He was looking for some future era more to his liking where he and his family could make a new life. 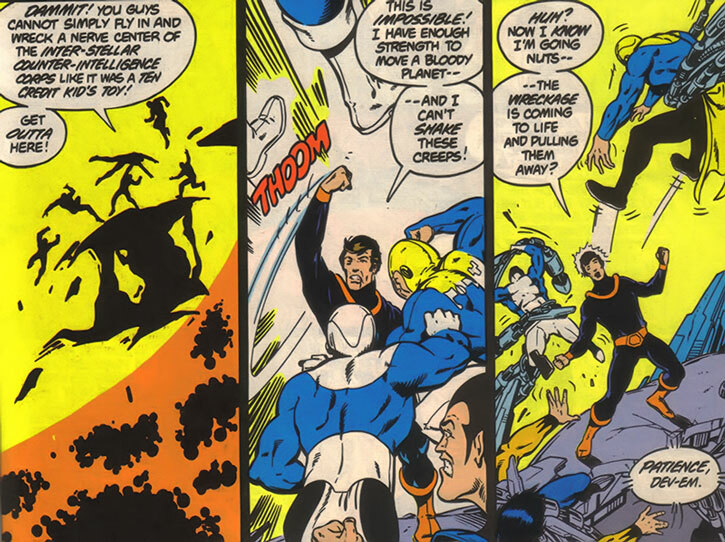 Superboy next encountered Dev-Em in the 30th century, at a meeting of the Legion of Super-Heroes. Dev-Em tunneled into Legion HQ and began photographing Legion secrets. But he set off an alarm and was captured by Superboy and Mon-El. 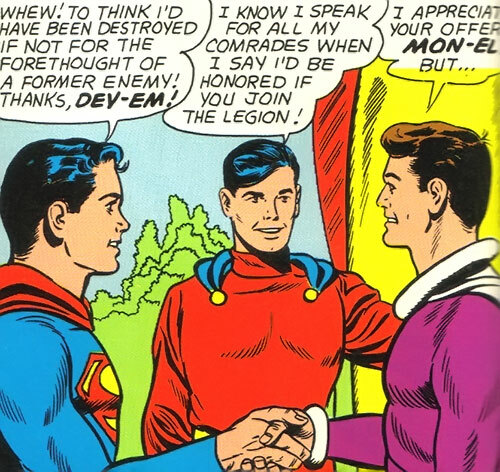 Superboy filled the Legion in on Dev-Em’s history. The Legionnaires decided to turn Dev-Em in to the Interstellar Counter-Intelligence Corps (ICC). Theft of Legion secrets was a breach of United Planets (UP) security. But Dev-Em only laughed and cockily informed the Legionnaires that he was actually on an ICC mission. When the LSH contacted the ICC, they learned that Dev-Em had reformed. At some point after appearing in the 30th century he decided to go straight and make something of his life. So he applied to the ICC, and after mind probing him to check his sincerity, the ICC accepted him as an agent. The ICC tasked Dev-Em with finding and capturing Molock the Merciless, the elusive leader of the Cosmic Spy League. Dev-Em attempted to infiltrate the group, doing some jobs for them. He won the chance to meet Molock personally…if he could obtain Legion security secrets. Dev-Em had broken in to Legion HQ to get the data he needed to set the meet with Molock. He intended to destroy the pictures before any harm was done. The ICC confirmed Dev-Em’s story, but now that the Legion was involved, the ICC changed strategy. They asked Superboy, who was more experienced at counterespionage, to take over Dev-Em’s mission. Superboy agreed, and with some hesitation, so did Dev-Em. Superboy wondered, though, if he could really trust Dev-Em’s supposed change of heart. 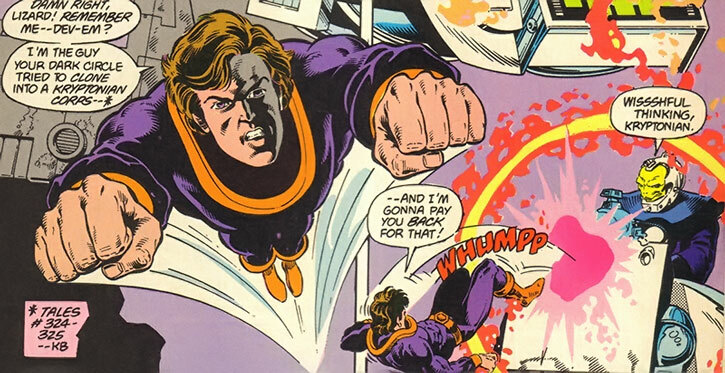 What if Dev-Em resented Superboy getting the glory of capturing Molock and breaking up the Cosmic Spy League? 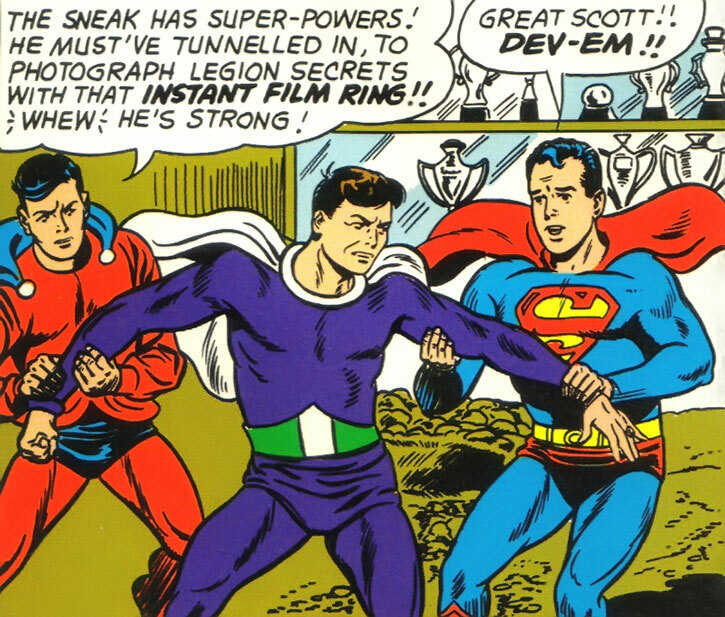 But Dev-Em’s hesitation was because he knew that Molock had possession of a chunk of gold kryptonite. Dev thought he should warn Superboy but didn’t want to tell the Legionnaire how to do his job, especially given their history. Luckily, Legion ally/pet Proty II decided on its own to read Dev-Em’s mind, presumably to check out his story. Proty II and Dev-Em conferred telepathically and came up with a plan. Dev-Em planted Proty in Superboy’s costume. Proty was thus able to act as Superboy’s ace in the hole. While the disguised Superboy met with Molock, Proty II disposed of the gold kryptonite and used its shapeshifting powers to impersonate it! The fake gold kryptonite, of course, didn’t affect Superboy at all. Molock was captured and the Cosmic Spy League was put out of business. After the mission, Superboy thanked Dev-Em for helping to save him, and Mon-El asked Dev-Em to join the LSH. 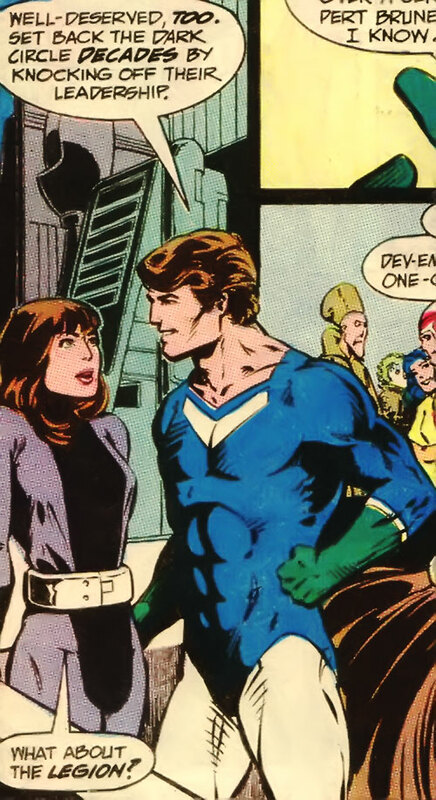 The Legionnaires were shocked when Dev-Em became one of the very few to ever turn down Legion membership. But Dev-Em preferred the life of an ICC agent. The Legion didn’t encounter Dev-Em again for many years. His activities in that time are unknown. He worked with the ICC and presumably took part in any number of classified missions. Ironically it was the Great Darkness, Darkseid’s attempted conquest of the universe, which brought Dev-Em’s activities to light once more. Darkseid possessed the entire population of the planet Daxam. This created an army of 3 billion beings with power equal to Superboy. Waves of mind-controlled Daxamites spread throughout the galaxy, smashing all resistance. One wave of Daxamites attacked a space station which served as a nerve center for the ICC. Dev-Em was there and fought with the Daxamites, but they each equaled him in power. He was being overwhelmed when the Heroes of Lallor arrived. Duplicate Boy snatched Dev away at superspeed, bringing him to the Lallorian starship. The Heroes immediately sent the ship into warp space where the Daxamites couldn’t track them with super-vision. The Lallorians had come to assist the Legion against Darkseid, and knowing of Dev-Em’s powers as a survivor of Krypton, they came to enlist him in the fight. 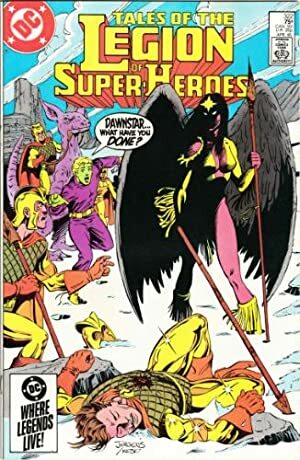 While the LSH confronted Darkseid directly, Dev-Em, the Heroes of Lallor, and the Wanderers, organized by the Legion of Substitute Heroes, tried to turn back the Daxamite invasion. They stood at Weber’s World, an artificial planetoid which served as the UP’s administrative capital. Vastly outnumbered and overpowered, this group had no real chance against the Daxamites. But they did slow the onslaught, buying additional time for refugees to evacuate. Ultimately they kept Weber’s World from being destroyed just long enough for the Legion to draw Darkseid’s attention and deplete his powers in other battles. He lost his mental control over the Daxamite hordes. Dev-Em and the other allies then led the freed Daxamites back to Darkseid, this time to fight alongside the LSH. 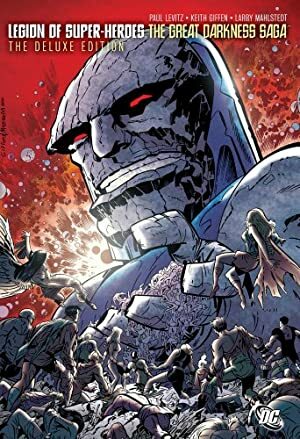 The arrival of 3 billion Supermen forced Darkseid to concede, and he seemingly gave up his plans of conquest and disappeared. Dev-Em had some R&R following that battle. He went to Lallor to see the sights with the Heroes of Lallor. Then they joined the Subs and the Wanderers back on Earth, to attend a Legion anniversary celebration. But soon Dev-Em was called back to duty and assigned to infiltrate the Dark Circle. Dev-Em was sent to infiltrate the apparent homeworld of the Circle. 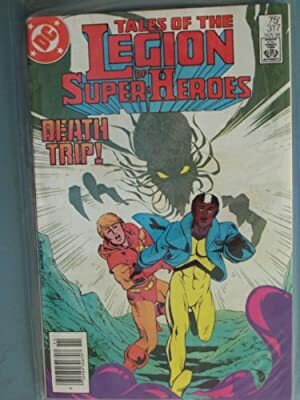 A team of Legionnaires (Supergirl, Brainiac 5, and Sun Boy) had recently pursued a Dark Circle double agent there, a traitorous SP officer named Ontiir. They violated Dark Circle territory and contributed to a decline in already hostile relations. They also uncovered evidence of extensive espionage and of some technologies which surpassed UP levels. Dev-Em was sent to assess the situation on the Dark Circle homeworld and learn what secrets he could. The mission was a joint venture with the Science Police, and an SP operative was assigned to function as his handler and liaison back to the UP. The officer assigned to work with him was initially Shvaughn Erin, who typically worked as SP Liaison to the Legion of Super-Heroes. Shvaughn was later called back to Earth and replaced with Officer Gigi Cusimano. Meanwhile, Dev-Em’s attempted infiltration had been discovered by the Dark Circle’s leadership. They allowed him to get close, even discovering their great secret. The Dark Circle had mastered cloning technology, and had populated an entire empire by cloning just five beings (the five of the Dark Circle’s ruling council, including Ontiir) over and over again. But the Circle had also obtained kryptonite. When they were ready, they captured Dev-Em and subjected him to the cloning process. Five brainwashed clones were created and immediately sent to attack UP space along the Dark Circle border. Additional clones would be made as quickly as possible. But the Dark Circle had overreached. Officer Cusimano raised the alarm — even as a Dev-Em clone was destroying the UP Fleet’s base on Amadus, she got a signal through to Earth. In response, the Legion sent Mon-El, Ultra Boy, and the White Witch to help. This team of Legionnaires was powerful enough to battle the Dev-Em clones on a nearly even footing. They managed to find and rescue the real Dev-Em. The White Witch then crafted a spell causing Dev-Em to reabsorb all his clones. With the help of additional reinforcements from the Legion, the genetic material stolen from Dev-Em was reclaimed and the Dark Circle’s supreme council was captured. Despite needing to be rescued by the Legion, Dev-Em received several benefits from the successful completion of his mission. He got an ICC commendation for his work, and SP Chief Zendak tried to convince him to come work for the Science Police. Dev didn’t take the job, but he did begin a flirtation with Officer Cusimano. Meanwhile he was assigned to track down leftover Dark Circle agents and saboteurs on Earth. He found one in Greater Sanagelopolis, on the west coast of North America. Another Ontiir clone was using advanced technology to cause widespread flooding along the California coast. Dev-Em went into action, this time aided by two Legion veterans (Mon-El and Brainiac 5) and four Legion applicants (Comet Queen, Tellus, Magnetic Kid, and Quislet). The Legion was in the midst of its biggest open call for new members in years, and used the flooding as a test of some of their top applicants. Dev-Em flippantly remarked that he should maybe reconsider the Legion’s offer of membership, if they were so “desperate” as to consider applicants like Comet Queen and Tellus. None too pleased, Mon-El answered that the offer had been made years ago and might not be open anymore. Despite the friction, Dev-Em and the heroes worked together well enough to capture the Ontiir clone. But Dev-Em was still happy with the ICC, and Mon-El and several other Legionniares felt that they had plenty of good candidates with better attitudes than Dev-Em. So once again Dev-Em and the LSH went their separate ways. Dev-Em’s actions following that assignment are unrevealed. Dev-Em is a moderately tall and well-built (but not bulky) man with brown hair and eyes. He generally sports a cocky grin. Dev-Em’s a secret agent, not a super-hero; he doesn’t wear a costume per se. Many of his outfits have a purple or magenta tinge to them similar to what he wore on Krypton. On several occasions he’s worn a (highly preferable) costume consisting of a black bodysuit with brown boots, belt, collar, and cuffs. Of course he can wear whatever he needs to while on a mission. Dev-Em is a cocky, arrogant rogue and ladies’ man who’s nevertheless found a heart for doing the right thing. He’s got a bit of a Han Solo vibe. He approaches most missions with a casual, almost lazy confidence, secure in his skills and his powers. He respects the Legion, especially Mon-El, but can be a bit patronizing. Many of them are basically kids in a super-hero club, in his eyes. He’s also plenty flirtatious with a “rough and ready” style. This can sometimes come off as a little smarmy or patronizing, too, but it seems to work for him. At any rate, these days his heart’s definitely in the right place. He’s willing to risk his life to do the right thing. Conversely he was outraged to have been cloned by the Dark Circle. That they had twisted and used a part of him against his will filled him with revulsion. In a subsequent encounter with one of the Circle’s ubiquitous clones of their perennial agent Ontiir, that anger instantly boiled to the surface past his normally cavalier façade. It’s not an out-of-control anger, though. He simply drops the rogueish persona and becomes intensely focused. This version of Dev-Em is from the original, pre-Crisis DC Universe. See my “Dev-Em 3001” writeup for a slightly different take on the character. Both are very different from the post-Crisis/pre-Zero Hour Dev-Em (the mad Daxamite of the “Five Year Gap” Legion written by Keith Giffen and the Bierbaums) or the Dev-Em of the Man of Steel movie universe. Both of those versions would require different writeups. 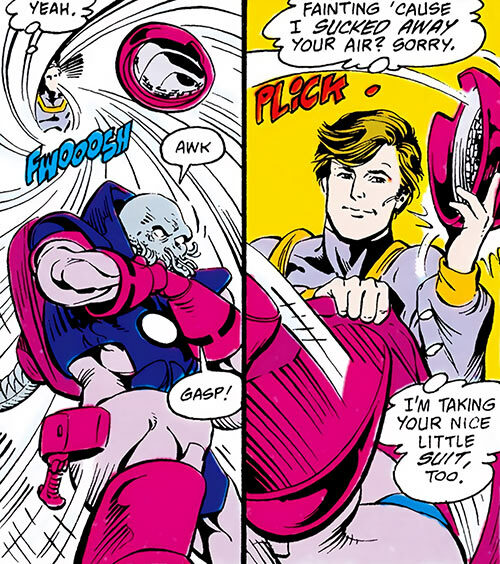 Air Control can be derived from the use of Super Breath or Superspeed. For example, he can make someone pass out by inhaling all the available air. Superspeed must be activated (-1). This requires sacrificing a Dice Action, and his speed kicks in at the very beginning of the next Phase (early enough to affect Initiative). His basic Initiative thus doesn’t include the Superspeed Bonus. Area Knowledge (various safehouses), Credentials (Agent of the Interstellar Counter-Intelligence Corps — Low), Expertise (Kryptonian technology), Languages (English, Interlac, Kryptonese). Heroes of Lallor (Low), SP Officer Gigi Cusimano (Low), SP Officer Shvaughn Erin (Low), SP Police Chief Zendak (Low), Interstellar Counter-Intelligence Corps (High), Legion of Super-Heroes (Low), Science Police (Low). Pre-Crisis Kryptonian Vulnerabilities Package (see below). Dev-Em generally doesn’t need much in the way of equipment, but he’ll sometimes make use of mission-specific devices. For instance, on one occasion he used a distorter to assume the appearance of a Dark Circle lackey. See the Legion Equipment writeup for distorter stats. Attack Vulnerability (-4 CS OV/RV vs. attacks laced with ’red solar rays’. This obviously applies only when the Kryptonian is not already under a red sun.). SIA to having gravity-based attacks lower his power. If this SIA kicks into action, gravity-based attacks have the additional effect of lowering Dev-Em’s Attributes and Powers by any RAPs they get, for RAPs of time. RAPs are cumulative as long as any RAP is active. If this SIA doesn’t kick into action, then Dev isn’t particularly bothered by gravity attacks. Fatal Vulnerability (Green Kryptonite, range of 2 APs). Gradual Loss Vulnerability (all Attributes and Powers, being within 2 APs of Green Kryptonite – however the Gradual Loss is 3 APs per Phase). Loss Vulnerability (Permanent Loss, all Attributes and Powers, being within 2 APs of Gold Kryptonite). Minor Physical Restriction (being within 2 APs of Red Kryptonite induces bizarre physiological and/or psychological changes). Dev-Em is basically a pre-Crisis Character on a Post-Crisis scale, but I’ve tweaked that scale just a bit. 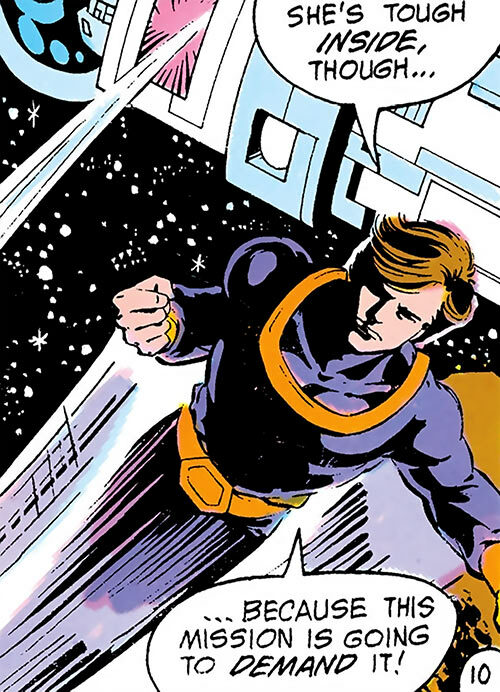 Dev-Em, like other Kryptonian and Daxamite characters in LSH stories, is more than capable of flying interstellar distances at trans-light speeds. 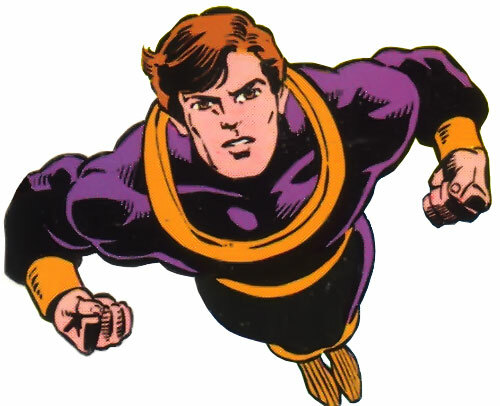 The high flight speeds of characters like Mon-El, Ultra Boy, Superboy, Wildfire, and Dawnstar are well established in many Legion stories. Those characters are often sent to trouble spots ahead of other Legionnaires, who must follow in the slower Legion Cruisers. Dev-Em’s Flight speed is therefore still at pre-Crisis (1st edition) levels. By that scale, Superman has Flight: 45. I’ve made Dev-Em equal to Mon-El and Supergirl, at 44 APs. On the other hand, Superspeed is mostly based on 2nd edition levels. Superman has Superspeed 14; Dev-Em is right with him. Note that if you’re using the “Superman’s DEX is 10” school of thought, then Dev-Em’s DEX should drop to an 08 or 09. Finally, Dev-Em has a Loss Vulnerability to red suns, not just a Gradual Loss Vulnerability as in some pre-Crisis writeups (notably the 1980s version of Supergirl). 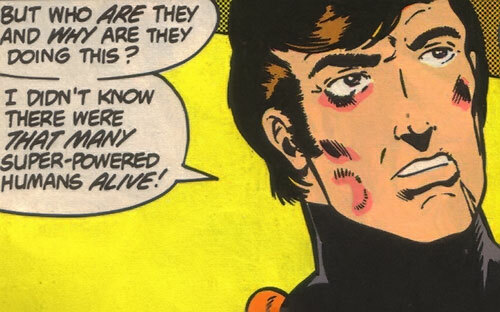 Pre-Crisis Kryptonians instantly lose their powers under a red sun — in Legion stories, anyway. Source of Character: Pre-Crisis DCU (Superboy, Adventure Comics, Legion of Super-Heroes). Helper(s): darthrose (for a careful editing eye), Sébastien Andrivet (for his writeup of the Pre-Crisis Supergirl). Writeup completed on the 16th of September, 2013.